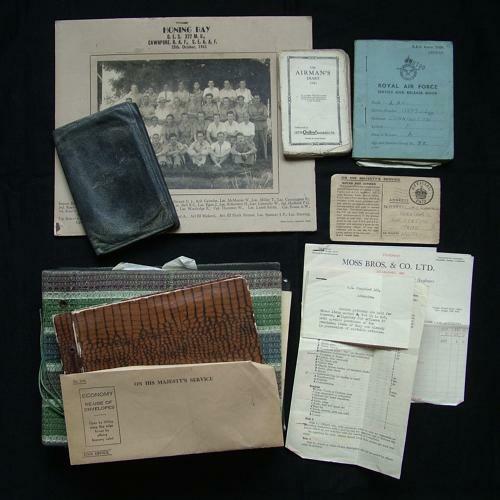 Paperwork and photograph album grouping relating to LAC Frank Cunnington who was based at Honing Bay, RAF Cawnpore, S.E.A.A.F. and worked as machine tool fitter/operator. It includes a nice 1945 dated 20 x15cm group photograph (30 x 25cm mount with full details printed), his service and release book ; original 1941 dated Moss Bros. of Covent Garden receipt detailing all of his uniform items from the tunic (£7 7 shillings) and peak cap (£2 4 shillings) to 3 pairs of V'R's at 7 shillings and sixpence! Air Ministry pamphlet 102 addendum (1 sheet) details the outfit required on appointment to a commission in the RAFVR c.1941. Also comes with a leather wallet embossed with RAF pilot wings and a very worn 'Airman's Diary 1941'. Like many of us Cunnington started the year with almost daily entries throughout January but this isn't sustained and the majority is blank. What entries there are tell of his first thoughts of joining up, 'very nice place by the sea, very nice landlady very oblidging, food very good & a lot better than Cardington station', 'get good pay in a trade in the RAF but, you need it you spend plenty...'. Finally there are two photograph albums. The smaller one is approximately 20 x 15cm and contains many small images of life in India - buildings, people, colleagues, animals etc. There are roughly 90 photographs in total. The second album is approximately 26 x 18cm. It contains a good group photo at Honing Bay c.1945, images of native people, buildings and animals, Indian dancers etc. Approximately 45 images in total. Note that the majority of the images do not have RAF content. Stock code P22519.